The Senate Finance Committee hearing on Republicans' latest health care bill is about as chaotic as congressional hearings get, with senators talking over one another, testifying about bills they wrote (which is unusual), and protestors in wheelchairs being dragged out of the committee room. Be smart: This dramatic political showdown is all happening for a bill that's widely assumed to be dead. Not only are Republicans highly unlikely to pass this bill, but now they'll also have to deal with photos of disabled people in wheelchairs being removed from a hearing about a bill they fear could take away their health care coverage. 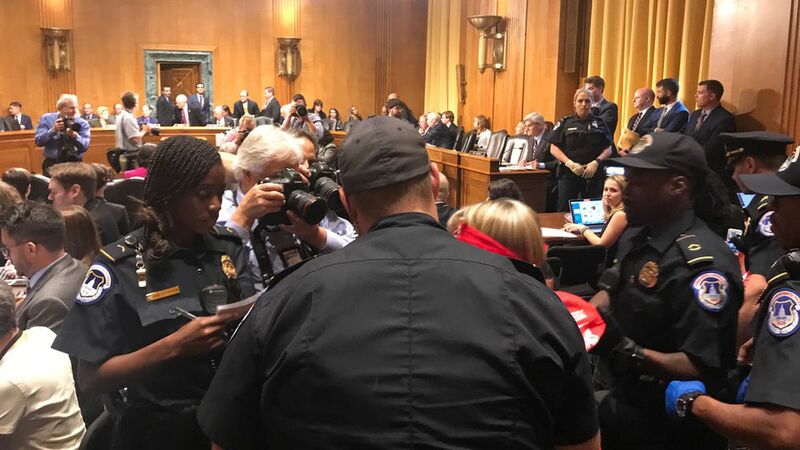 Protestors attending today's hearing on Republicans' health care proposals were immediately removed by Capitol police after they began chanting, "No cuts to Medicaid, save our liberty" as soon as Chairman Orrin Hatch gaveled the hearing into session. The hearing couldn't begin for roughly 20 minutes — until the protestors, many in wheelchairs, had been removed. "If you can't be in order, then get the heck out of here," Hatch said once the protestors were removed. Sen. Bill Cassidy, one of the bill's sponsors and one of the witnesses testifying at the hearing, said the most recent version of the bill is also the final one, aside from corrections to drafting errors. Ranking Member Ron Wyden asked if the most recent version of the bill is the one the Senate will vote on. "Yeah, I believe so…I hope a correction of a drafting error doesn't constitute a whole 'nother version," Cassidy replied. Why this matters: Sens. Rand Paul and Ted Cruz are withholding their votes for the bill unless they get policy changes they've asked for. Cassidy made it sound like those changes aren't coming. Sen. John McCain is the third public "no" vote, meaning the bill is looking pretty dead.